My previous column postulated on China’s role in the climate change “circus.” I suggested that their apparent change of heart on the issue was really just a change of strategy. Like The Economist, another leading European publication, The Financial Times (FT) has also been a believer in man-made climate change. FT carried extensive coverage of the 2011 UN climate change talks—even producing a twelve-page supplement: Climate Change Review, Durban 2011. 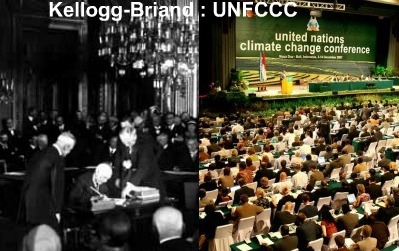 Here in the US, the climate change talks in Durban were barely mentioned. Within FT’s reporting they state that the European Union (EU) “is pushing hardest among developed countries for a new global deal” and is “the greenest voice among wealthy countries at the talks.” Is the EU uniquely insightful, or like China, is their role in the ring also more about economic strategy? Perhaps, herein, lies “the circus”—with the EU as the star performer. The countries that have resisted, or rejected, binding greenhouse gas reduction agreements are generally countries with abundant natural resources: the US, China, India, Russia, and Canada. Australia, another country rich in resources, is still performing in “the circus.” The EU, on the other hand, has limited resources—leaving them to depend on nuclear power, natural gas from Russia, and oil imported from the North Sea and Middle East. The quest for oil was one of the factors that prompted World War II—both Germany and Japan had it in their sights. For the EU to be energy independent, they must develop “renewables”—specifically wind and solar power. Wind and solar resources do generate energy, but they are more expensive than the traditional fuels that other regions have in abundance. Renewable energy costs put the EU at a competitive disadvantage in the global marketplace, perhaps, making it advantageous for the EU to support a scheme that artificially raises the cost of traditional fuels in competing nations. Hence, support for emission reductions that hurt other economies more than the EU, could make the EU the primary driver for climate-change interventions. Could the EU’s lack of abundant natural resources have contributed to its current economic crisis? Italy provides an illustration of this hypothesis. Italy is one of the EU members in need of a financial bailout. At the introduction of the euro, Italy had a €25 billion trade surplus. Today, they have a €35 billion trade deficit. However, if its oil consumption is removed from the mix, Italy actually has a trade surplus. Therefore, if Italy could, somehow, reduce its dependence on oil imports, the country’s account balance would improve due to lower import volumes. Renewables offer Europe “domestic” energy, albeit more expensive energy, and therefore provide Europe with energy needed for manufacturing and industry. However, more expensive electricity puts Europe at a competitive disadvantage with other markets—especially the United States. Enter the premise of man-made global warming and climate-change interventions. American environmentalists embraced the potential energy reductions. It almost worked. Had the US signed on to the Kyoto protocol and/or passed cap and trade, for example, our energy costs would be considerably higher than current rates due to forced implementation of renewable energy—rather than allowing the free market to pick winners. Instead, the jig is up. Even the environmentalists acknowledge that they need a new approach. Yet, Europe clings to a global plan for emission reductions through the UN and instituted a Ponzi-like cap-and-trade program that would have enriched Eurocrats. It has discouraged scientific rigor and fueled the man-made global warming scheme, by encouraging and recognizing those who assisted in garnering favorable publicity for the fear, uncertainty, and doubt of man-made climate change. Maybe it has never been about saving the planet. This premise leaves Europe in an economic tailspin, without hope of easy recovery, and grieves global governance supporters who believe that the playing field needs to be leveled. President Obama’s energy policies—such as his support of cap and trade, resistance to developing America’s oil-and-gas resources, and backing of more expensive renewables, while killing affordable coal resources—make us the clown. In November 2012, Americans will decide if we, as a country, will go the route of Europe, or if we will have economic growth fueled, like Canada, by an abundant and affordable supply of energy. Will we vote to save the circus, or save America? The author of Energy Freedom, Marita Noon is the executive director for Energy Makes America Great Inc. and the companion educational organization, the Citizens’ Alliance for Responsible Energy (CARE). Together they work to educate the public and influence policy makers regarding energy, its role in freedom, and the American way of life. Combining energy, news, politics, and, the environment through public events, speaking engagements, and media, the organizations’ combined efforts serve as America’s voice for energy. Tillamook, Oregon…famous for their cheese/magnificent coastline: averages nearly 13 inches of rain in December (this year, less than .25 inches). You mention “killing affordable coal”….yet, you don’t mention the cost of illness due to mercury in the emissions, the hidden cost of dealing with nearly 61 million tons of coal ash (I imagine you want a slurry pond in your neighborhood) and you failed to discuss massive tax subsidies to the coal industry for year. Now, I respect your pro-business agenda. That is fine…and needed. Yet. to deny any and all evidence of the effects of CO2 is sad, transparent and lacks commonsense. Merry Christmas, John F. Borowski/Oregon…. As a scientist I reject all the hocus pocus of man caused global warming. Lets use our abundant coal and reap the economic benefits from low cost energy until such time a super battery is developed that will make the use of solar and wind reliable on a 24 hr per day basis. It will also give us the robust greenhouse gas needed to increase the world food supply and fend off the next epoch of Pleistocene glaciations which I believe inevitable unless we allow our global climate to warm a few deg C.
The Gillard government in Australia were fooled. I can’t see our tax helping the Europeans since our manufacturing for export is non existent so higher energy costs simply shift whatever is left to Asia. In turn the Asians burn our coal to provide them with cheap energy so they can undercut the Europeans even more. Who ever dreampt this scheme up made a few fundamental errors and didn’t allow for unintended consequences. The global economic downturn will aid the dumping of green schemes as much as the downturn in global temperatures. Europe will have an albatross around it’s neck for years to come as they scramble to once again produce cheap energy, probably from nuclear. The climate is changing! Natural forces as well as the growing human population impacting upon the forests are in combination causing climate behavior that is difficult to predict. What is evident is that the amount of water in the atmosphere has increased. These climate changes have nothing to do with the premises of the cap and trade and climate change assumptions based on the alleged capability of increasing CO2 levels to cause the changes. Myths are created in the process: peak oil; dirty energy sources; CO2 driven climate. What are these myths for? The evident result is we as the people of this planet have to work harder to pay more for energy costs! Why is this higher cost being paid for when supposedly, humanity, having achieved efficiency by working through computers, better work systems and energy efficient electrical accessories and devices, energy efficient cars, more compact, aerodynamically designed have required lesser number of liters per kilometer? We have built energy efficient buildings, energy efficient airplanes, boats, etc, and having become energy efficient, we must pay for more energy cost. What is the basis? Myths!! !